The first of our eagerly anticipated Spring Talks will feature ten Academy members who will each entertain you with a short stand-up comedy routine. These brave â€œpioneersâ€ are graduates of facilitator Michael Coleâ€™s Stand-Up Comedy For Seniors workshop this year, and their routines on the 11th will focus on the humorous issues and challenges of advancing age. 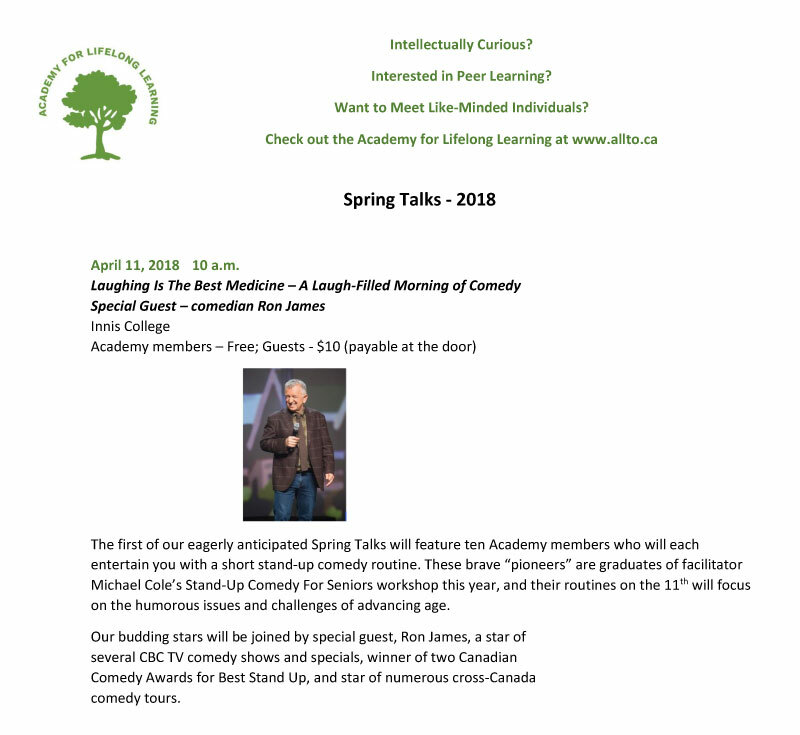 Our budding stars will be joined by special guest, Ron James, a star of several CBC TV comedy shows and specials, winner of two Canadian Comedy Awards for Best Stand Up, and star of numerous cross-Canada comedy tours. Spring Talks run weekly from April 11 – May 16.